In this tutorial, I’ll show you the best way to create a two-column Pardot form. 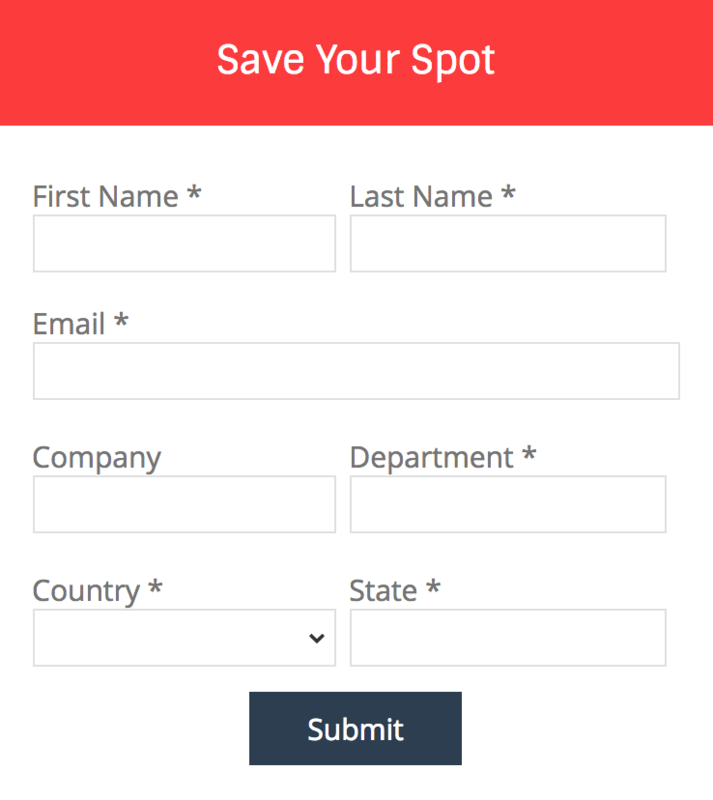 This is a follow up on my original post How to Create a 2 Column Pardot Form. By popular request, this new method includes a way to make certain form fields full width and is fully responsive. 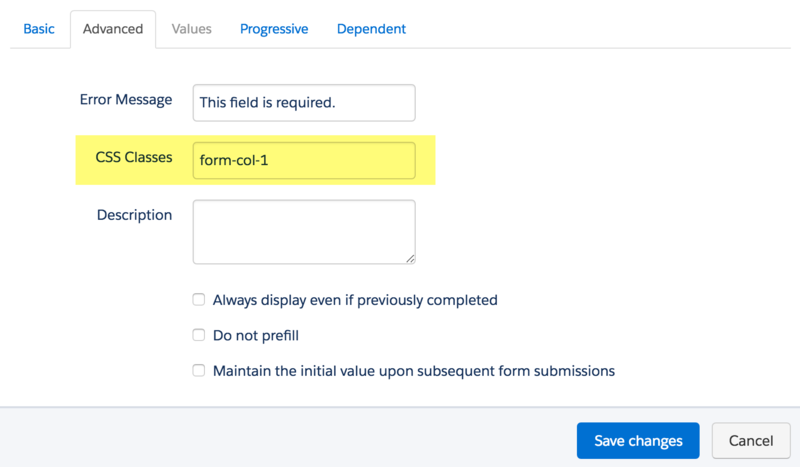 All you have to do is add CSS classes to your form fields and copy & paste the CSS provided into Pardot. form-col-1: Add this to form fields that will be in the left column. form-col-2: Add this to form fields that will be in the right column. form-col-full: Add this to form fields that you want in a single, full-width column. To add a class to a form field, navigate to the fields tab of your form, click on the pencil icon to edit the form field. 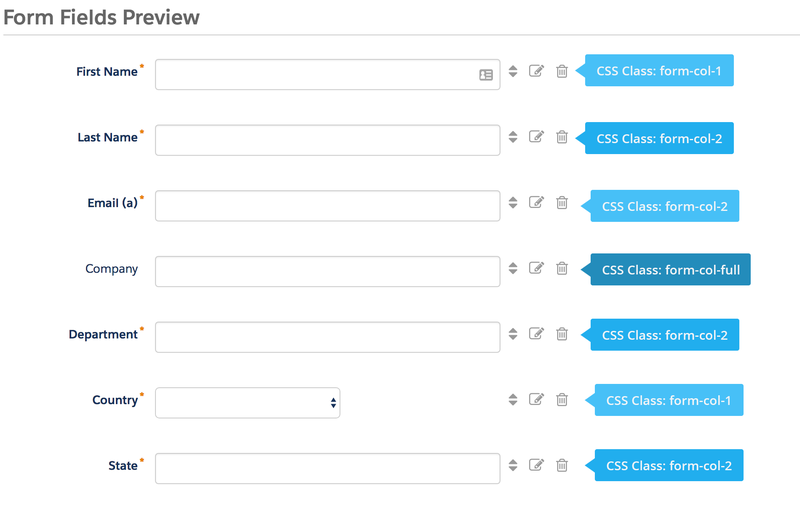 Then, click on the advanced tab and enter the class name in the CSS classes field. Repeat this process until all form fields have one of the three classes. Here’s an outline of what my sample form looks like, where all the fields are in two columns except for the email field which is full width. By default, every form field within your form will be wrapped in paragraph tags (<p></p>). This is not ideal when it comes to creating two-column forms, but it’s easy to update. Navigate to your layout template and click on the Form tab. Change the paragraph tag to a DIV and close it right after the error message fields, as illustrated below. Alternatively, replace the ENTIRE content within the form tab with the code below. Next, you need to add the following CSS in Pardot. You can add this in the layout template or within the form editor under look and feel > above form. Here’s what my example form looks like with all the CSS added. Nevermind! I figured it out, it was a setting in the template form. THANKS! Great help!! So happy to have found this page. I had one question, if I'm looking on the landing page on my phone, I only see the email & submit button. Is there a way to make it show or is this something pardot is doing? Thanks for the help! When I copy in the CSS by either method it just adds code to the page, it doesn't except it as actual code.